Update: We've got some more information and diagrams from Micron's Winter Analyst Conference earlier today. 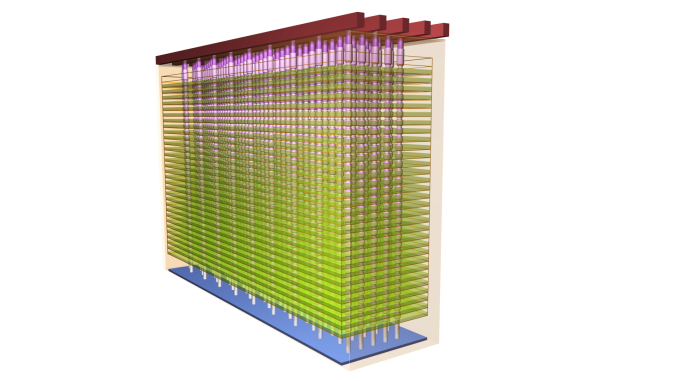 After samples of their upcoming 3D NAND were sighted in the wild at CES, Micron has taken the time to provide some details about the flash memory and their plans for it. A lot of this is a recap of information we've previously covered, but we've got some new details and a better idea of the roadmap for the future. The entire flash memory industry has shifted focus to the devlopment of 3D NAND flash memory as the replacement for planar NAND flash memory. Samsung took an aggressive approach and has enjoyed some great success with their V-NAND branded 3D NAND, but it hasn't been an entirely trouble-free transition. Micron has been more conservative both in technology and timing, but they plan on having a strong competitor on the market later this year. Micron's first generation 3D NAND takes the form of a 256Gb MLC die and a 384Gb TLC die (compare with their 128Gb 16nm MLC and TLC). At a high level, the die will be partitioned into four separate planes, compared to two planes for most competing NAND. A 480GB drive using the four-plane 256Gb dies will have access to approximately the same amount of parallelism as a 480GB drive using two-plane 128Gb dies, so this capacity jump won't bring the performance drops that have tarnished some NAND process shrinks. The key development that allows Micron to produce a four-plane die without inflating die size and cost relative to the two-plane competition is that they've layered much of the required additional circuitry under the 3D flash array, instead of sitting alongside. 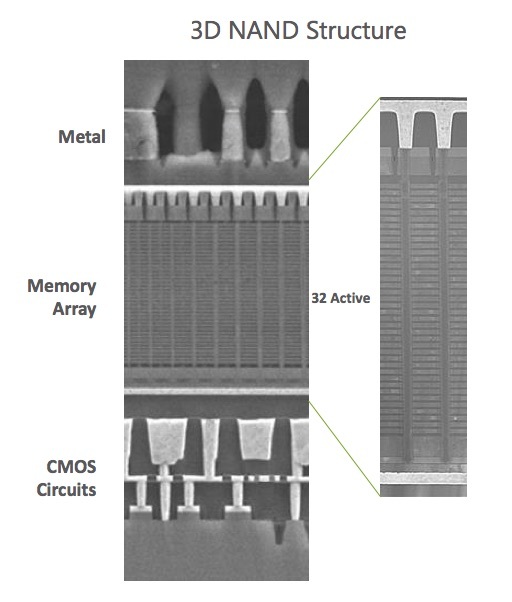 Micron says that their "CMOS Under the Array" design puts more than 75% of the logic (things like address decoding and page buffers) under the flash memory. It doesn't make the additional segmentation of the four-plane design entirely free, but it allows it to be a very cost effective performance optimization. This is still planar CMOS logic, not any kind of 3D or stacked logic; it's just got some metal interconnect layers and the flash array piled on top. On a smaller scale, the 3D NAND will have a page size of 16kB and erase block sizes of 16MB for the MLC and 24MB for the TLC. Because CPUs and filesystems are still mostly dealing with 4kB chunks, Micron has included a partial page read capability that allows for a 4kB read to be done a bit faster and with about half the power of a full 16kB page read. This helps offset some of the penalty the larger page size can have on random 4kB read performance. The large erase block sizes won't have much of a direct impact on performance and are a necessary efficiency measure: erasing requires charge pumps to produce higher voltages than reads or writes use, and it's a slower and more power-hungry operation. If you're going to fire up that extra circuitry and block access to the entire plane for 1ms or more, you might as well erase a usefully large amount of flash. For the architecture of the individual memory cells, we have nothing new to report. Intel and Micron are alone in their decision to stick with floating-gate flash technology instead of transitioning to charge-trap flash. We've previously explained how the technologies differ and what kinds of advantages the manufacturers want to reap from the change. The cost is that the design process involves different tradeoffs that are not as thoroughly explored and understood as the dynamics of floating-gate flash, and for now Micron is sticking with what they know. Micron's 3D NAND might not have the best write endurance, but they're expecting to have an advantage in data retention time for healthy flash. They aren't providing exact numbers, but they're estimating that drives relying on simpler BCH ECC can get effective program-erase cycle lifetimes in the thousands and drives with LDPC will have effective cycle counts of tens of thousands. Once the process has matured it should exceed their 20nm planar NAND's write endurance. The first 3D NAND Micron has ready for the market will produced to the endurance standards for client drives, with enterprise-grade 3D NAND following later. 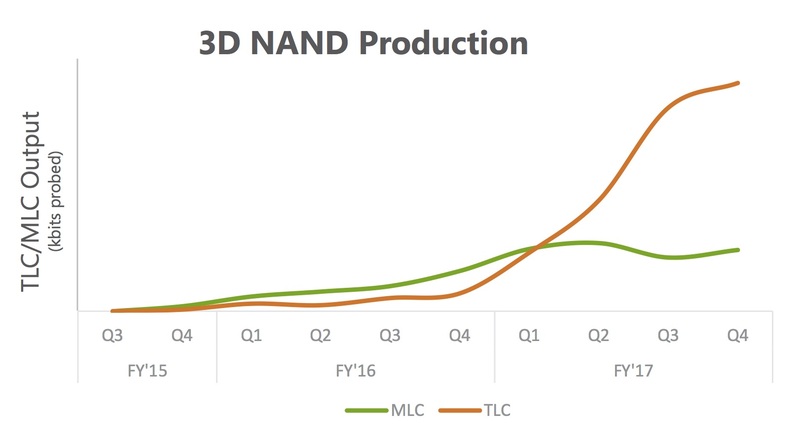 The MLC is currently a few weeks ahead of the TLC in the qualification process, but given the state of the client SSD market the TLC will be the more popular product and will overtake the MLC in volume produced within a few months of 3D NAND drives hitting the market. Overall their 3D NAND will comprise a majority of their flash output on a per-GB basis by the second half of 2016. Micron is sampling drives with 3D NAND to partners this month and is planning for general availability in June. Other drive vendors using Micron's NAND will be on similar release schedules. Micron hasn't announced any specific drive models, but they've given a general roadmap that is unsurprising. Consumer and client products will come during the middle of the year, with the capacity and cost improvements allowing for things like 2TB 2.5" drives and 1TB single-sided M.2 drives. Toward the end of 2016 and into 2017 we'll see enterprise products such as very high capacity (8TB+) drives and updates in the existing product segments for SAS and PCIe drives. Looking further to the future, Micron gave a presentation last week at the IEEE International Solid-State Circuits Conference entitled "A 768Gb 3b/cell 3D-Floating-Gate NAND Flash Memory". This was more about bragging about their R&D in an academic context than announcing any concrete future product plans, but it does represent the most likely successor to their first-generation 3D NAND. The chip in question provides a whopping 768Gb (96GB) capacity when operated as TLC, and 512Gb (64GB) as MLC. The die size is about the same as their 32-layer 384Gb TLC, the areal bit density is almost doubled, and most of the other details are the same—implying that the layer count has probably increased, though Micron isn't saying how many layers it uses. If Micron has plans to switch to charge-trap flash they're keeping it under wraps for now, and any such transition isn't imminent. The second-generation 3D NAND will start production in their Singapore fab this summer, and volume will be ramping up around the end of 2016 (during the second quarter of their fiscal year 2017). 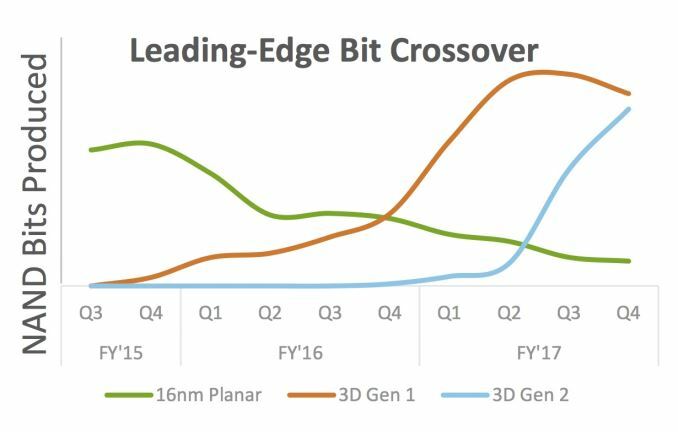 Micron predicts their second-generation 3D NAND will be at least 30% cheaper per Gb than the first generation, which they report to be at least 25% cheaper than their 16nm planar NAND. Nice that it has 4 planes, with 48GB TLC dies i was wondering about perf per SSD capacity. Others do have 768Gb on their roadmaps in 2017 so even if this will be gen 2 for Micron (it's not clear yet that it is), it is in line with (some) others., capacity wise. The precise timing fort each remains to be seen. Can't say i have a clue about the xpoint controller and what perf and power it can get. In phones one of the main goals would be to get rid of some or all RAM for a big gain in battery life- no idea how they plan to implement it and before we have more details it is futile to speculate. Intel seems unlikely to get those instructions into Atoms or even mobile before they get them into Xeon, and likewise to do their usual clusterfsck of supporting them so randomly across processors that it will be ten years before anyone can rely on them. So no CPUs in the near future, which means that even if Android ARE working on this support in the OS, they can't push it out (or even test it) for a while --- and when it comes to storage you want to test a LOT on REAL hardware before you ship it into the field. So it's certainly coming, but I'd be amazed if I saw it in Android before 2019 or so. Apple COULD have it as early as 2017 because their tight integration means they could even have test silicon in house right now. It would be worth looking at the storage talks at WWDC this year and next year to see if they provide any hint as to ways of doing things that most make sense on an NVM design. When i mentioned xpoint it was a 2017 matter, and that at best.